This video includes Lucas and his expert stone masons moving boulders over 10,000 pounds that they can only lift with the crane. See the stone work progressing and join us in the process of setting and positioning some these extremely large boulders. The extreme outdoor design with multiple pools is being filmed from College Station, Texas. This outdoor design makes all our other projects look tiny. The pool is 12 foot deep, the size of three swimming pools and also includes a separate “winter pool” with a large spa. Our biggest natural stone grotto waterfall will be placed along with stone waterfalls around the pool. We will be filming this project daily and you will be able to see all the stone work for this pool in stages as it progresses. If you haven’t already, I recommend subscribing to this channel today because the transformation of this pool to paradise is going to be unbelievable and one of the most exciting construction projects you’ve ever seen! This swimming pool construction project will have all the natural stone set by Lucas Congdon and Lucas Lagoons master stone masons. The “Need a Crane to move Boulders over 10,000 pounds for this Extreme Swimming Pool with Waterfalls” video is part of a Video Series about the progress of this swimming pool construction project in Texas. they are always appreciated. Thanks for watching and look forward to more great videos to come. This video includes Lucas updating us on the progress of this extreme outdoor design and large swimming pool with over 180 tons of natural stone. We are making great progress with well over 100 tons of natural rock and boulders set in and around this large swimming pool. See the stone work progressing and join us in the process of setting and positioning some these extremely large boulders. The extreme outdoor design with multiple pools is being filmed from College Station, Texas. This outdoor design makes all our other projects look tiny. The pool is 12 foot deep, the size of three swimming pools and also includes a separate “winter pool” with a large spa. Our biggest natural stone grotto waterfall will be placed along with stone waterfalls around the pool. We will be filming this project daily and you will be able to see all the stone work for this pool in stages as it progresses. If you haven’t already, I recommend subscribing to this channel today because the transformation of this pool to paradise is going to be unbelievable and one of the most exciting construction projects you’ve ever seen! This swimming pool construction project will have all the natural stone set by Lucas Congdon and Lucas Lagoons master stone masons. The “Progress Update from Swimming Pool in Texas with Over 100 tons of Rock Set for Multiple Grotto Waterfalls” video is part of a Video Series about the progress of this swimming pool construction project in Texas. This video includes Benjamin Krywick, a pool contractor of 149 Pools, checking in on the progress of the stone work in Texas. Lucas and Ben talk about some neat features incorporated into this extreme outdoor design and large swimming pool with over 180 tons of natural stone. This extreme outdoor design with multiple pools is being filmed from College Station, Texas. This outdoor design makes all our other projects look tiny. The pool is 12 foot deep, the size of three swimming pools and also includes a separate “winter pool” with a large spa. Our biggest natural stone grotto waterfall will be placed along with stone waterfalls around the pool. We will be filming this project daily and you will be able to see all the stone work for this pool in stages as it progresses. If you haven’t already, I recommend subscribing to this channel today because the transformation of this pool to paradise is going to be unbelievable and one of the most exciting construction projects you’ve ever seen! This swimming pool construction project will have all the natural stone set by Lucas Congdon and Lucas Lagoons master stone masons. The “Ben Checks in on the Progress of this Extreme Outdoor Design with Swimming Pool” video is part of a Video Series about the progress of this swimming pool construction project in Texas. 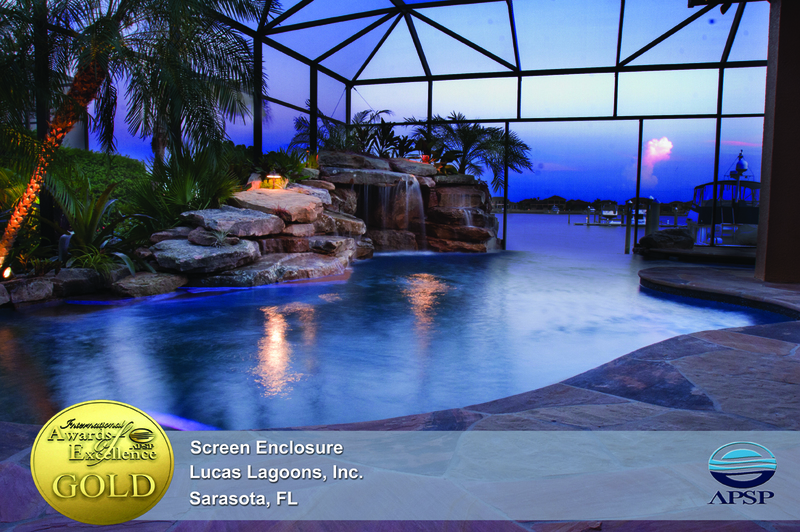 We just received the news that Lucas Lagoons was awarded a gold International Award of Excellence from the Association of Pool and Spa Professionals. Hurrah! This job was really fun and a great challenge. We demolished the existing swimming pool and replaced it with a lagoon swimming pool with a negative edge. On one side of the swimming pool negative edge is a grotto water fall. Because of the design, the water fall appears to emerge out of the Riviera Dunes Harbor. Pretty cool. Another challenge was creating a great looking negative edge within a screen enclosure. We did this by changing the usual screen design so that the aluminum posts actually frame the edge. Check out the video showing Lucas building the natural stone grotto waterfall. The clients were delighted with the project, as were we. See other award winning projects. This video includes the progress of our stone work by professional stone masons building natural stone waterfalls and grottos in Texas. We face challenges everyday between the equipment keeping up with the weight of the boulders and getting the right rock delivered in time to keep up with the pace of our master stone masons setting boulders and natural stone. This extreme outdoor design with multiple pools is being filmed from College Station, Texas. This outdoor design makes all our other projects look tiny. The pool is 12 foot deep, the size of three swimming pools and also includes a separate “winter pool” with a large spa. Our biggest natural stone grotto waterfall will be placed along with stone waterfalls around the pool. We will be filming this project daily and you will be able to see all the stone work for this pool in stages as it progresses. If you haven’t already, I recommend subscribing to this channel today because the transformation of this pool to paradise is going to be unbelievable and one of the most exciting construction projects you’ve ever seen! This swimming pool construction project will have all the natural stone set by Lucas Congdon and Lucas Lagoons master stone masons. The “Progress of Stone Work for Large Pool Construction with Natural Stone Waterfalls in Texas” video is part of a Video Series about the progress of this swimming pool construction project in Texas. This video includes some tense moments that are bound to happen when setting large rock boulders thousands of tons. These natural stone boulders are for a swimming pool that will have multiple grotto waterfalls with all natural stone. This ultimate outdoor design with pools is being filmed from College Station, Texas. This outdoor design makes all our other projects look tiny. The pool is 12 foot deep, the size of three swimming pools and also includes a separate “winter pool” with a large spa. Our biggest natural stone grotto waterfall will be placed along with stone waterfalls around the pool. We will be filming this project daily and you will be able to see all the stone work for this pool in stages as it progresses. If you haven’t already, I recommend subscribing to this channel today because the transformation of this pool to paradise is going to be unbelievable and one of the most exciting construction projects you’ve ever seen! This swimming pool construction project will have all the natural stone set by Lucas Congdon and Lucas Lagoons master stone masons. The “Tense Moments at Swimming Pool Construction with Large Boulders Swinging in Texas” video is part of a Video Series about the progress of this swimming pool construction project in Texas. This video is the first stage of setting large rock boulders for this swimming pool that will have multiple grotto waterfalls with all natural stone. This ultimate outdoor design with pools is being filmed from College Station, Texas. This outdoor design makes all our other projects look tiny. The pool is 12 foot deep, the size of three swimming pools and also includes a separate “winter pool” with a large spa. Our biggest natural stone grotto waterfall will be placed along with stone waterfalls around the pool. We will be filming this project daily and you will be able to see all the stone work for this pool in stages as it progresses. If you haven’t already, I recommend subscribing to this channel today because the transformation of this pool to paradise is going to be unbelievable and one of the most exciting construction projects you’ve ever seen! This swimming pool construction project will have all the natural stone set by Lucas Congdon and Lucas Lagoons master stone masons. The “First Day of Rock Work Setting the Large Boulders for the Grotto Waterfalls in Texas” video is part of a Video Series about the progress of this swimming pool construction project in Texas.